1.4. Unless expressly stated otherwise, where rights and decisions are to be exercised or made at our discretion, then we shall be under no duty or obligation to you to justify or provide a reason for the decision. 1.5. Where our prior written consent is required in these Conditions, we shall not unreasonably withhold or delay in giving that consent. 1.6. All rights expressly reserved by or granted to us by these Conditions shall be without prejudice to any other rights which we may have from time to time. 1.7. We reserve the right to amend these terms and conditions should the need arise. 2.1	These Conditions (as updated by us from time to time) shall set out the entire agreement. No variation of these Conditions shall be binding unless agreed in writing by us and attached hereto. You will be subject to the policies and terms in place at the time you order the Goods from us, unless such change is required by law or government or regulatory authority (in which case it will apply to any orders you have previously placed). These Conditions apply to all purchases you make from us at any time, regardless of how the order is made. 2.2	Our employees and agents are not authorised to make any representation concerning the Goods unless confirmed by us to you in writing. In entering into a Contract you acknowledge that you have not relied on any such representations which are not so confirmed. 2.3	Where Goods are to be delivered by instalments, each instalment shall constitute a separate Contract. Failure by us to deliver any instalment shall not entitle you to cancel any other instalment. 2.4	All specifications, drawings and particulars of weights, dimensions and performance issued by us are approximate only. 2.5	We reserve the right to withdraw any offer or special promotions without notice. In the event that you have already placed an order under the Conditions that we have accepted we will provide you with a full refund for any money received. 4.1. The price of the Goods shall be the price confirmed by us at the time the order is placed. 4.2. While we try to ensure that all prices on our website are accurate, errors may occur. If we discover an error in the price of goods you have ordered (whether this is by our error or an error by any third party), we will inform you as soon as possible and give you the option of re-confirming the order at the correct price or cancelling it. If we are unable to contact you, we will treat the order as cancelled. If you have already paid for the goods and the order is subsequently cancelled, you will receive a full refund. 4.3. In the event that we are unable to supply the Goods at the price or specification stated in the order, we will where possible notify you of any changes and where the Goods ordered are not available we may offer you substitute goods whereby you will be asked to re-confirm your order at the new price and/or specification. You are not obliged to accept any substitute Goods and will be entitled to receive a full refund if you confirm that the substitute Goods are not acceptable. 4.4. The price is inclusive of any applicable value added tax or other sales tax (at the rate from time to time in force). Any packaging or delivery costs for which you shall be liable will be confirmed prior to your order being placed. 5.1. Please see our Payment Options for our terms of payment. 5.2. If you fail to make any payment on the due date then we reserve the right to: (a) cancel the Contract or suspend further deliveries to you; (b) charge you a reasonable amount of interest on the amount unpaid, at the rate of 3% above Barclays Bank Plc base rate from time to time from the date the amount was due until payment is made in full, accruing pro rata on a daily basis. 5.3. In the event that a cheque or credit card payment is dishonoured by your bank or credit card provider, they (being your bank, credit card provider or any debt collection company that we use to recover the debt) may charge a fee. Where we incur any fee or liability as a result of a dishonoured payment, you will be liable to reimburse us in full for the amount we have incurred. 5.4. All credit and charge card holders are subject to validation checks and authorisation by the card issuer. If the issuer of your payment card refuses to authorise payment to us, we will not be liable for any delay or non-delivery. In addition, in the interests of preventing fraudulent use of credit, debit and charge cards, WoolOvers Ltd will validate the names, addresses and other information supplied during the order process against commercially available records (e.g. Electoral Roll data, credit reference services). We reserve the right to instruct a third party to complete these checks. By ordering from our website you consent to such checks being made. We may need to contact you by letter, telephone or email to verify details before we are able to process and dispatch your order or we may be unable to accept your order and we shall not be liable for any delay or non-delivery this may cause. Any information given may be disclosed to a registered Credit Reference Agency which may keep a record of the information. All information provided will be treated in accordance with the Data Protection Act 1998. 6.1. You shall make all arrangements to take delivery of the Goods whenever they are tendered for delivery. 6.2. We aim to provide you with an approximate date on which the Goods will be ready for collection or delivery. Where we become aware that the date of delivery may be delayed, we shall notify you as soon as possible and aim to provide you with a revised date. We shall not be liable for any loss you incur, whether financial or otherwise, resulting directly or indirectly from our delay or failure to meet the estimated date. Time for delivery shall not be of the essence of the Contract unless previously agreed in writing by us. We may deliver the Goods in advance of the quoted delivery date upon giving you reasonable notice. 6.3. If we fail to deliver the Goods (or any instalment) for any reason other than any cause beyond our reasonable control or your fault, and we are accordingly liable to you, our liability shall be limited to the excess (if any) of the cost to you (in the cheapest available market) of similar goods to replace those not delivered over the price of the Goods. 6.4. If you ask our delivery provider to leave the goods in a safe place or at checkout request special instructions then you are deemed to accept total liability for the goods if we comply with your instructions. 6.5. In the event we fail to deliver the Goods to the cardholder’s registered address or any such alternative address within 90 days or following 3 attempts by us (whichever is earlier) due to reason(s) reasonably considered to be your fault than we may in our discretion refund the sum paid to us by you and cancel the Contract. 6.6. If you fail to take delivery of the Goods or fail to give us adequate delivery instructions at the time stated for delivery then we reserve the right to store the Goods until actual delivery and charge you for the reasonable costs (including insurance) of storage or subsequent delivery charges which we may incur. 6.7. Please see our Delivery and Returns policy here for postage charges. 6.8. You will be liable for all customs requirements and duties arising for delivery of Goods outside the UK. We accept no responsibility for these requirements and duties. Any such charges must be borne by you and you are responsible for complying with all laws and regulations of the country in which you are importing the Goods. We shall not be liable for delayed delivery times due to packages being inspected by customs. You agree that if we incur any liability due to your failure to comply with custom requirements and duties by you that you shall reimburse us for all loss, damages, costs and expenses awarded against or incurred by us in connection with such claim. 6.9. We may pass personal information to third parties for the purpose of fulfilling orders. 6.10. In certain countries we offer the option for customers to collect their deliveries at Parcel Shops. This service is provided by a third party. The delivery label on the parcel will still incorporate your home address in order to facilitate your identification on collection. 6.11. If an item/items are purchased and qualify for free standard delivery but are later returned to us which brings the amount spent below any qualifying level, delivery charge will be deducted from any refund. 7.1. Risk of damage to or loss of the Goods shall pass to you in the case of Goods to be delivered otherwise than at our premises, at the time of delivery or, if you fail to take delivery of the Goods, the time when you have collected the Goods. 7.2. Notwithstanding delivery and the passing of risk for the Goods to you, the transfer of the ownership of the Goods shall not pass to you until we have received in cleared funds payment in full of the price of the Goods. 7.3. Until such time as the as the property in the Goods passes to you and where you fail to pay for the Goods in accordance with these Conditions, we shall be entitled, at any time, to require you to deliver up the Goods to us and, if you fail to do so seek a court order to permit us to enter upon any premises where the Goods are stored and repossess the Goods. 8.1. Subject as expressly provided in these Conditions, and except where the Goods are sold to a person dealing as a consumer (within the meaning of the Unfair Contract Terms Act 1977), all warranties, conditions or other terms implied by statute or common law are excluded to the fullest extent permitted by the applicable law. 8.2. Where the Goods are sold under a consumer transaction (as defined by the Consumer Transactions (Restrictions on Statements) Order 1976, as amended) your legal rights are not affected by these Conditions. Further information on your legal rights can be obtained from Trading Standards or Citizens Advice Bureau. 8.3. The warranty contained in Clause 8.1 does not apply to any defect in the Goods arising from fair wear and tear, wilful damage, accident, negligence by you or any third party, if you use the Goods in a way that we do not recommend, your failure to follow our instructions, or any alteration or repair you carry out without our prior written approval. 8.5. Subject to clause 8.6 and clause 8.7, if either of us fails to comply with these Conditions, neither of us shall be responsible for any losses that the other suffers as a result, except for those losses which are a foreseeable consequence of the failure to comply with these Conditions. 8.6. Subject to clause 8.7, neither of us shall be responsible for losses that result from our failure to comply with these Conditions which fall into the categories of loss of income or revenue, loss of profit, loss of business, loss of anticipated savings, loss of data, any waste of time. However, this clause [8.6] shall not prevent claims for foreseeable loss of, or damage to, your physical property. 8.7. Nothing in these Conditions excludes or limits in any way our liability for death or personal injury caused by our negligence, fraud or fraudulent misrepresentation, any breach of the obligations implied by section 12 of the Sale of Goods Act 1979 or section 2 of the Supply of Goods and Services Act 1982, defective products under the Consumer Protection Act 1987 or any other matter for which it would be illegal or unlawful for us to exclude or attempt to exclude our liability. 9.1. Neither party shall be liable to the other or deemed to be in breach of Contract by reason of delay or failure to perform any of that party’s obligations if the delay or failure is due to an act or cause beyond that party’s reasonable control. 9.2. These Conditions do not purport to confer a benefit on any third party. 9.3. Any notice required or permitted to be given by either party to the other under these Conditions shall be in writing or by email addressed to the other party and delivered to the address or email address provided at the time the order is confirmed or any subsequent or alternative address which one party may notify to the other from time to time. 9.4. Where we do not take action against you for any breach of the Contract, we shall not be prevented from taking action against you in respect of any subsequent breach of the same or any other provision. 9.5. Where any competent authority deems any Condition to be invalid or unenforceable in whole or in part, then the offending part shall be removed and the validity of the remainder of the Conditions shall not be affected. 9.6. The Contract and these Conditions shall be governed by the laws of England and Wales, and you agree to submit to the exclusive jurisdiction of the English courts. 9.7. We reserve the right to monitor and record telephone calls our staff receive and make, in order to monitor staff performance and ensure the highest service possible is provided to our customers. 9.8. The copyright in all photographs, images and descriptions contained in our catalogue and on our website are owned by WoolOvers Ltd, and may not be reproduced without the express consent of WoolOvers Ltd.
9.9. All dealings between us in connection with these Conditions and each Contract shall be carried on in the English language. 9.10	You may not transfer any of your rights or obligations under these Terms to another person without our prior written consent, which we will not withhold unreasonably. We can transfer all or any of our rights and obligations under these Terms to another organisation, but this will not affect your rights under these Terms. 10.1. If, for any reason you are unhappy with the Goods, you have the right to cancel your order at any time within 14 calendar days from the day on which the Goods were received. 10.3. If you wish to cancel after the Goods are despatched, you have up to 14 calendar days to return your item(s) from the date of your cancellation request. You have a legal obligation to take reasonable care of the Goods whilst they are in your possession. If you fail to comply with this obligation we have a right of action against you for compensation. Please refer to our Returns policy. 10.4. Please note that the right of cancellation does not apply where Goods are specifically made to your specification or personalised at your request. 11.1. We may make available to you promotional codes from time to time. Any use by you of a promotional code in respect of an order shall only be permitted where used by the person for whom it is intended and for a single use. 11.2. Promotional codes are not valid in conjunction with any other offer. 11.3. There is no cash alternative available in respect of the promotional code. 11.4. We may withdraw the promotional codes at any time without notice. 11.5. Promotional codes are only available on UK mainland orders unless otherwise stated. 11.6. Promotional codes cannot be used against postage and packaging costs unless it is a code that can be used exclusively for free postage and packing. 11.7. Promotion codes cannot be used after the expiration date. 11.8. Promotional codes will only be accepted if submitted at the point of order. We will not subsequently apply a promotional code if the order is submitted without the promotional codes application. Please check your order thoroughly before placing to avoid disappointment. 11.9. The promotional code will be applied proportionally to the Goods purchased. Any returns or refunds on Goods purchased with the benefit of a promotional code will be on the promotional price as indicated on the sales invoice. If you have purchased products as part of an offer or discount, the amount refunded will be adjusted accordingly to reflect any failure to meet the original requirements for the offer or discount as a result of returning the product. 12.1. We may in our sole discretion offer competitions to you at such times and in such manners as we deem appropriate. 12.2. All prizes offered are non-transferable and cannot be substituted for a cash alternative. 12.3. There will be one entry per person, per residential address only unless otherwise stated. We may in our discretion deem duplicate entries void. 12.4. There will be only one winner per competition, drawn at random after the closing date unless otherwise stated. 12.5. Our decision as to the winner of the competition is final and no correspondence shall be entered into. 12.6. Winners will be notified by email. 12.7. Prizes will be delivered to your nominated address at our expense. You shall inform us of all information necessary to ensure that the prize is delivered as soon as reasonably practicably. 12.8. Competitions are open to UK residents only unless otherwise stated. 12.9. Employees, families and friends of WoolOvers Ltd are not allowed entry. 12.10. Please read the terms and conditions of any competition carefully before taking part in the same. 13.1. We in our sole discretion operate an offer whereby you earn an incentive if you refer a friend who proceed to completing a purchase of Good(s) from us. 13.2. We reserve the right to substitute or amend the offer at any time. Any unused codes must be used by the expiry date. 13.3. We reserve the right to cease the Introduce a Friend promotion at anytime, should we choose to do this then we will honour all outstanding referred friend vouchers up to and including the date of termination. 13.4. You are responsible for ensuring you obtain your friends permission prior to you referring them as a friend. We will not accept any responsibility for an individual complaint in this regard following you submitting your friends details to us. 13.5. The promotional code will be applied proportionally to the Goods. Any returns or refunds on Goods purchased with the benefit of the promotional code will be on the proportional price as indicated in the sales invoice. 13.6. You will not receive any benefit of the scheme if your friend is already a customer of ours. 14.1. Multi-buy offers (for example, buy 4 for £60 100% Cotton Knitwear) only apply to those products to which the multi-buy offer applies and are clearly displayed as such. 14.2. Multi-buy offers are not valid when used in conjunction with any other promotions. 14.3. The multi-buy offers do not include, postage or customisation, which are charged in addition to the price of the Products. 14.4. No cash alternative will be given. 14.5. Items purchased within a multi buy offer can be exchanged for another item which forms part of the same multi-buy offer. Items from multi-buy offers cannot be refunded individually, you must return all items in that offer for a full refund. 14.6. 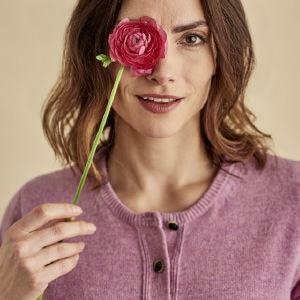 2 for £20 on 100% cotton jumpers is valid for a limited time only. Add 2 qualifying items from this offer to your basket where the discount will be applied automatically. If you return one item purchased from the 2 for £20 offer the discount is not applicable and the single item being kept is valued at £20. No monies will be refunded as the offer would now be invalid. These terms and conditions apply to online, mail order and shop purchases. 15.1. Gift Vouchers & E-Vouchers are non-refundable; items purchased via gift vouchers/e-vouchers can only be refunded back onto a gift voucher/e-voucher, they have an expiry date and if lost they cannot be replaced. 15.2. The Terms and Conditions can be found on the reverse of the gift voucher or at the bottom of the e-voucher email. The terms are: 15.2.1. Gift Vouchers/E-Vouchers can be used as full or partial payment in our store, over the phone or on our website. 15.2.2. Gift Vouchers/E-Vouchers cannot be refunded or exchanged for cash and no change will be given. Note: no change means that money will not be returned to the customer. If (s)he only partially redeems a gift voucher, the remainder of the balance will stay on the gift card. 15.2.3. Anything purchased or exchanged using a gift voucher/e-voucher can only be refunded to a gift voucher. 15.2.4. Lost/Stolen vouchers are the cardholders responsibility and cannot be replaced by us. 15.2.5. Gift vouchers/E-Vouchers are valid for a 24 month period commencing from the day they are purchased. 15.2.6. Items returned to our return warehouse will be refunded to a new gift voucher, which will be posted to you. Any refund over and above the original gift voucher/e-voucher value, will be refunded to the payment card used. 15.2.7. Gift Vouchers/E-Vouchers are issued by and remain the property of WoolOvers Ltd.
15.2.8. We reserve the right to amend the Gift Voucher/E-Voucher. Please see our individual Offer Terms & Conditions for more information. 17.9. We reserve the right to withdraw Value Promise at any time. Once we receive your claim one of our Customer Service team will review the details you have submitted, check the competitor item and site to validate the price match. Please allow 3-4 working days for this. We will also inform you of unsuccessful claims with a reason for our decision. 18.5	Nominated email and billing address must be used on all purchases. Any promotional offers sent by email will need to be registered using the email address that the promotional offer was received on. 18.6 All returns must be made using the Hermes prepaid label enclosed with your order (only 1 prepaid return per order). Returns service is only available on mainland UK in selected areas (please visit www.hermesparcelreturn.co.uk/find-a-parcel-shop.html to check your area). 18.7 The Hermes Parcel Returns service can be used for parcels weighing up to 15kgs. 18.8 WoolOvers VIP Club is only available to personal shoppers and will be cancelled if WoolOvers deems abuse of service has taken place or the service is being used for non personal purchases. 18.9 WoolOvers may terminate your WoolOvers VIP Club membership at our discretion without notice. 18.10 We will not be held responsible for any delay or failure to comply with our obligations under these Terms and Conditions if the delay or failure arises from any cause which is beyond our reasonable control. This condition does not affect your statutory rights. 18.11 If your email, billing address or postcode change, please email info@woolovers.com otherwise your WoolOvers VIP Club will not be applied to your order. 18.13	WoolOvers reserve the right to amend the Terms and Conditions at any time. 18.14 £19.99 gets you a year’s Next Working Day delivery and Hermes Pre-Paid Returns.